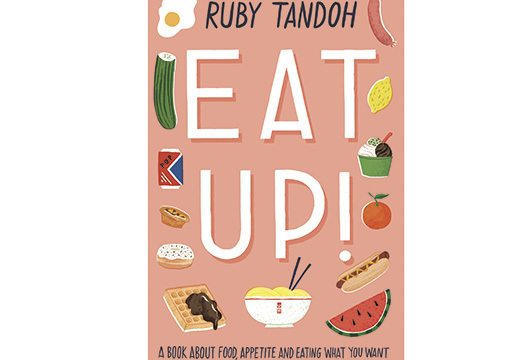 Ruby Tandoh loves food. She loves it so much that her first two cookery books weren’t enough to get the message across, and now her latest edition Eat Up! is devoted purely to the art of loving what you eat. Discussing everything from trendy pea-shoot smoothies, to Come Dine with Me, to the beauty of a Cadbury Creme Egg, this book is punctuated with anecdotes of food, love, psychology, and everything that meets in between. Eat Up! is a celebration of seemingly mundane food. It is not a ‘food book’ in the sense that it has pages filled with shiny photographs of dressed rocket salads and crushed avocado on toast. Instead, it spends winding pages discussing playful, warming dishes like Toffee Apple Rock Cakes (‘if you can love these… you can sure as hell love your own wonderful body’) and Potato Curry. As someone who squeals with excitement at the ping of my oven timer, I instantly loved this book. However, whilst I always liked the idea of dedicating a book to the art of food, I was pleasantly surprised at the amount of psychology within the narrative. Carefully slotted in amongst the bite-size recipes and foody anecdotes lie some rather trenchant observations, all with psychological backing. Tandoh casts a critical eye over so-called ‘wellness culture’, fad diets, and fat-ism and, importantly, acknowledges that hunger and appetite are both physical and psychological: ‘we may start a bowl of pasta to satisfy a hunger, and finish it to satisfy our senses’. She unpicks the ‘muddled, moral multitudes’ food ethics, and explores the social and political minefield that is ‘nutrition’. In a world that is equally concerned with both obesity and body image, Eat Up! digests all the psychological complexities surrounding our relationship with what we eat.